The church doesn't expect to end gun violence but hopes to spark a conversation about the power of transformation. 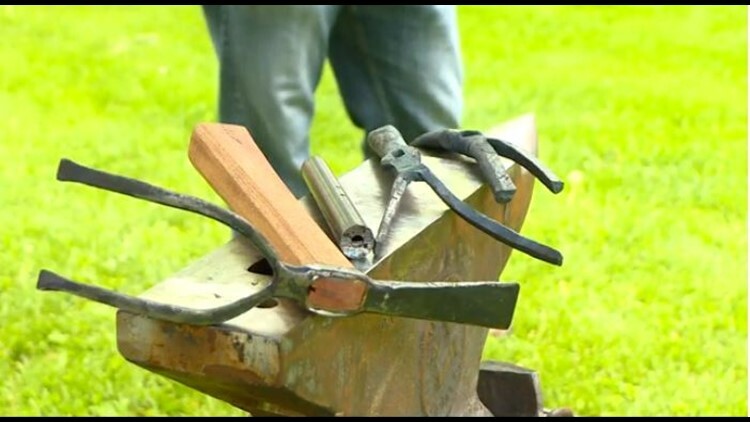 KUSA – Inside Beloved Community Mennonite Church in Englewood, the pastor pounded the piano keys while the blacksmiths outside got ready to beat the anvil. Martin is the executive director of RAWtools, a non-profit based in Colorado Springs. He’s still learning the trade he picked up after the 2012 shooting at Sandy Hook Elementary School in Newtown, Connecticut. “I hope it’s kind of offering another way to engage in the issues of gun violence,” Martin said. Martin repurposes guns into garden tools. He and his dad, Fred, teamed up with the church in Englewood to accept gun donations from the community. “We’ve had two rifles that have been dropped off today and we can make four to six garden tools out of each one of those rifles,” Martin said. The mission was inspired by a passage in the bible. “They shall beat their swords into plowshares and their spears into pruning hooks,” read Pastor Vern Rempel from Isaiah 2:4. Rempel and the congregation gathered outside the church Sunday afternoon to watch Martin and his father transform a couple gun barrels into tools. “Mennonites historically have been those who don’t go to war and seek other pathways for conflict,” Rempel said. The church doesn’t expect to end gun violence but hopes to spark a conversation about the power of transformation. “We are part of just a large movement of peacemaking in the world,” Rempel said.